Once the rain subsided, Mendham stuck with its plan, registering a 7-1 victory over Pitman to gain the New Jersey state title and advance to the regionals. 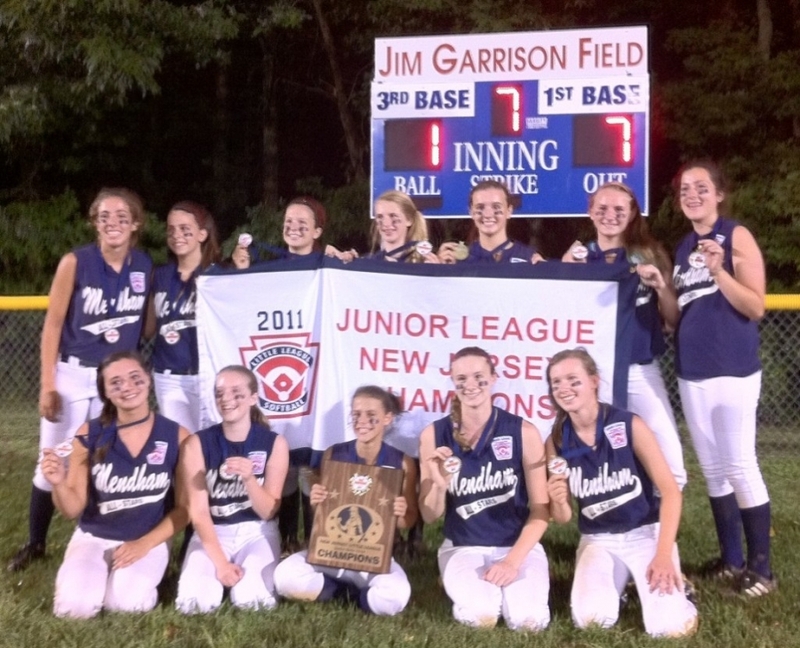 With the win, it became the first Mendham Little League team – baseball or softball – to claim a state championship. “We sat around waiting but the girls were ready to play,” Margiotta said of the final which commenced at 9 p.m. “They didn’t want to have another game. They took advantage of the opportunity they had to finish it off. The focus and drive were evident in the first 10 minutes of the game. Irene Margiotta, Mendham’s ace, struck out two of the first three batters she faced. Nikkey Skuraton, who drew a walk, scored on Caroline Roch’s fielder’s choice for a 1-0 Mendham lead. Mendham widened its advantage to 5-0 with a four-run fourth inning. Roch and Courtney Luing laced two-run singles and Dana Rafferty doubled in a run. Pitman got on the scoreboard in the sixth inning. Standout shortstop Rebecca Williams, who had three of Pitman’s four hits, scored the lone run. Errors in the bottom of the sixth inning contributed to Mendham’s last two runs. Irene Margiotta went the distance, finishing with seven strikeouts and four walks. Rafferty, her catcher, threw out a runner attempting to steal second. Mendham’s defense was flawless once again, committing no errors. Outfielders Geena Santomo, Michelle Stanton and Courtney Luing made running catches. A day later, the elder Margiotta was still marveling at her team’s determination in spite of the lengthy delay. There was no celebration Monday night as the Mendham squad did not arrive home until 1:30 a.m. after lengthy car rides. Lori Margiotta, who gave the team Tuesday off, figures the girls will “have a little party” on Wednesday. As for rest, Mendham will have little. The Eastern Regional Tournament commences Friday in West Haven, Ct. In a five-day span, Mendham will play nine pool play games. Mendham will face Milford of Delaware on Friday at 10:45 a.m. At 2:30 p.m., Mendham will meet Denton/S. Caroline/N. Caroline of Maryland. On Saturday, its opponent will be Black Rock of Bridgeport, Ct.